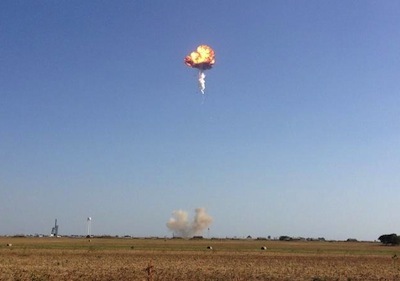 A serious anomaly occurred during the latest flight of SpaceX reusable test rocket F9R resulting in the Flight Termination Software destroying the rocket. This was the first test flight of the three engine test vehicle which is designed to fly higher than the single engine vehicles that had been tested up to this point. Elon Musk acknowledged the explosion on his twitter account. Several video’s have appeared online of the test flight and it seems clear that the rocket was having issues well before it exploded as it can be seen diverting left and right and appeared to flip over just before it exploded. What does this mean for SpaceX? First let us now forget that this is a test vehicle and therefore there was no guarantee that it would work, so far SpaceX have had a lot of success with the Grasshopper and F9R test flights but as they continue to push the limits something was bound to happen. Second these tests are for the re-usability functionality that SpaceX are planning for the future where they plan to return the first stages to the launch pad so that they can be reused. The design of this vehicle is also different, while the stage is the same size as the full Falcon 9 there were only three engines on this one not the full nine that would be found on a standard first stage. And let us not forget that NO-ONE else is even attempting to do this. However the timing isn’t ideal, just today the FAA approved the test flights of the DragonFly vehicle which is designed to test the propulsive landing capabilities of the Dragon spacecraft, also today the static fire test for the AsiaSat-6 launch was performed and appears to have been successful and finally the CCtCap awards are just around the corner and this failure could cause some in Congress to question awarding SpaceX with the CCtCap agreement until the results of the failure investigation are made available. SpaceX have not said if this failure will have an impact on the launch of the AsiaSat-6 satellite next Wednesday morning. They will be reviewing the data from the static fire test and will then holder a final review meeting to determine if the launch can proceed. Should they decide they need more time due to this failure that would be decided then. SpaceX will no doubt perform a full review of the F9R test flight to determine what happened and what needs to be done to address the issue. However the data they are collecting from the F9R is being supplemented by the successful return flights of the full Falcon 9 missions, while the two AsiaSat launches didn’t allow the full return test due to needing more fuel to launch the next Dragon flight to the ISS SpX-4 is due to launch in September and will allow another test to be performed. SpaceX have already announced that they will soon attempt to land on a barge however no further details are available at the moment. We have no doubt that SpaceX’s competitors will be jumping all over this failure regardless of the fact that it was a test flight and we are also sure that those on congress how have voiced opposition to SpaceX will also try to make the most of this. The key question for us is how will SpaceX handle this?